You can’t take your money with you when you go. How to leave your money to your family, not the taxman. You can’t take your money with you when you go, but you can make absolutely sure that it doesn’t get frittered away in taxes. 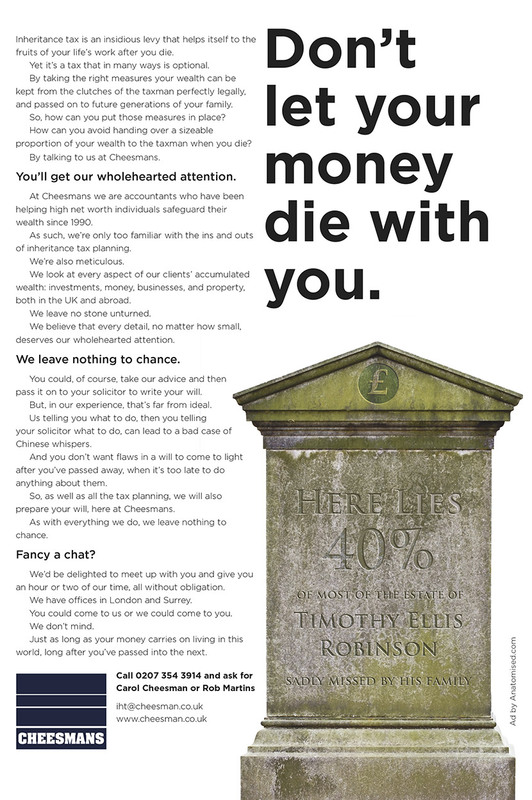 That was the message that North London accountants, Cheesmans, asked us to get across in an advertisement to appear in ‘Premier’ magazine, a publication aimed at high net worth individuals living in Surrey and Chelsea. Cheesmans were keen to publicise their Inheritance Tax planning service and the fact that, quite legally, an individual’s wealth could be kept out of the clutches of the taxman. So, at the end of February, David Hughes and Mike Everett, visited Cheesmans’ HQ in Islington for a briefing from Carol Cheesman and her team. “David was in Asia, so we entered into an email conversation about the elusive visual. In the end, we decided that a gravestone with a suitable inscription would do the job well”. When David came back, he and Mike visited Carol Cheesman to show her the finished ad. She loved it, and so did her colleagues. Here it is, just as it appeared in ‘Premier’ magazine. As they say, there’s nothing in life that’s certain except death and taxes. At Anatomised, we like to think there’s something else: our ability to produce work on time, on budget, and on the button. We think the Cheesmans ad does this in spades. Can a website be an advertisement?